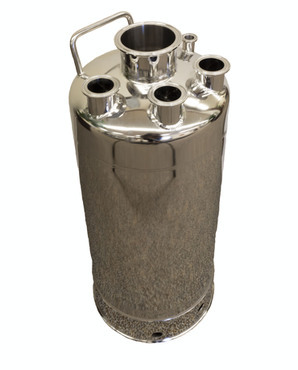 5 Gallon T-316L Stainless Steel Skirt Pharmaceutical/Hygienic Vessel - Alloy Products Corp.
For most applications, Type 316L low-carbon stainless steel is the material of choice in the product contact area. Low-carbon stainless steel eliminates sensitization or carbide precipitation in the vessels weld areas, and it reduces the formation of chromium carbide, which can deplete chromium from the weld areas and expose them to corrosion. A stainless steel rich in chromium provides maximum passivity. We can assist you in selecting the appropriate material for your particular vessel and application. Vessel fittings are sanitary-clamp type or equivalent in order to CIP or SIP, with the length-to-diameter ratio of each fitting not exceeding 2.0 whenever feasible. All fittings and accessories are located in positions that enhance vessel cleanability and sterility.